Welcome to Part 6 of Getting Social, an iClassPro original blog series. Word-of-Mouth Marketing, or WOMM as we will refer to it, can be one of the most powerful forms of advertising. WOMM is when your business is being advertised by someone other than you. It is when your customers believe in your brand so much that they think it is worth telling others about. Word-of-mouth is renowned as the most trusted form of advertising. The graph below shows a 2011 survey trust scale of marketing. A popular form of social media WOMM is user-generated content or UGC. UGC is content shared by your customers about your business or brand. 86% of millennials say that UGC is a good indicator of the quality of a brand or service, and UGC videos (such as those shared on Facebook) can increase sales effectiveness by up to 20%. WOMM is considered a prime level of marketing to have reached because your customers have become more than customers, they are brand ambassadors. Why is WOMM so important? Because it works. According to Ogilvy, 74% of consumers identify word-of-mouth as a key influencer in their purchasing decision. 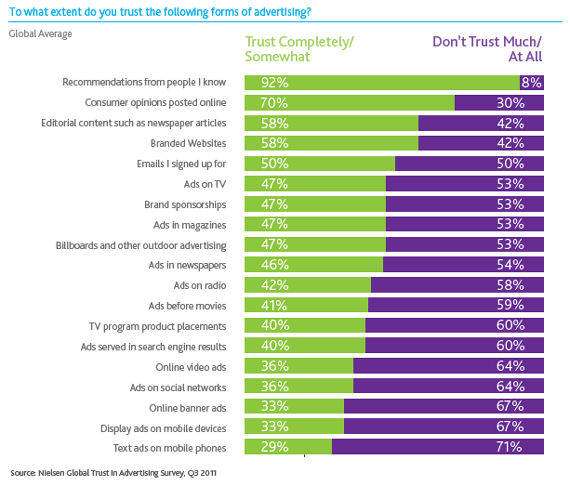 Nielsen found that 92 % of consumers believe recommendations from friends and family over all forms of advertising, and 68% trust online options from other consumers. 72% say reading a positive customer reviews increase their trust in a business; it takes, on average, 2-6 reviews to get 56% of them to this point according to BrightLocal. Millennials ranked word-of-mouth as the number one influencer in their purchasing decisions according to Radius Global. Build a Close Knit Social Media Community— The key to building a social media brand community is engagement. You must engage with your customer and have your customer engage with you. As social media presence continues to expand, WOMM is only becoming easier for your business. A study conducted by Pew Research Centers in 2012 found that 65% of internet users use social media. Of users on Facebook, 58% liked a brand page in 2011 and 41% shared content about that brand on their wall. Sharing content with friends online is even more valuable as verbal word of mouth. Because, while words are fleeting, The Internet is forever. Honesty is Key— Word-of-mouth marketing happens when a customer trusts a brand. The mechanic that you send your friends to because he told you you didn’t need a new transmission after all. Honesty helps customers develop a connection through human emotion. Honesty can be conveyed through social media simply by fielding customer questions and concerns. Make your Customers Feel Valued— Great customer service shows customers that they are valued. As mentioned in a past blog post (Getting Social: Building Brand Loyalty), investing in current customers is far less expensive and far more valuable than “buying” new customers. Satisfied customers will be more likely to spread the word about your brand. Simplify the Review Process— As mentioned, face-to-face is one thing but the internet is forever. Find ways to simplify the process for your customers to leave reviews, recommendations, and to communicate with each other. Consider having business accounts on sites such as Google, Yelp, Angie’s List, Twitter, Facebook, etc. These platforms will give your customers a space to communicate about your brand. You can even share customer testimonials/reviews on your website or social media page. Make your Content Share-worthy— UGC can be promoted by creating interesting content that your customers would want to share with their friends. Your business can create unique hashtags that your customers might likely use. Offer an Incentive— Put into place a referral program to encourage your customers to refer their friends or encourage them with coupons when they leave reviews online. You can also incentivize your customer to share your content by rewarding them with a gift, discount, or other prize.